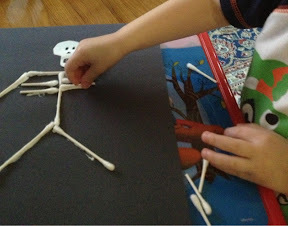 Tristan woke up this morning with a fever, but by noon he was asking to do another craft. Oh, how I wish I had his energy, especially when I'm sick! 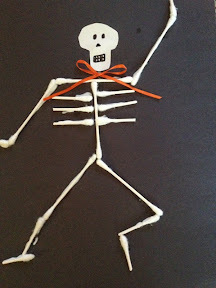 Luckily, I had the supplies for another Halloween craft. 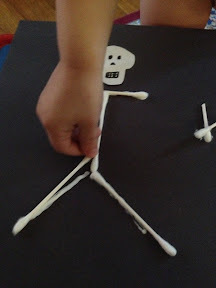 This time we made a skeleton. Our supplies were Q-Tips, tacky glue, a paper for the face and a bow for some color. I put the glue down and he turned and positioned the Q-Tips himself. He followed directions so well! I was super impressed.